The art of wine making has a long and rich history. Because of this, most wineries have a rich history of their own. Both through the process they follow and the story of how they got their start, wine makers take great pride in what sets their wine apart. For Brancott Estates, this meant they were the first to produce Marlborough Sauvignon Blanc in their home country of New Zealand, when others thought it wasn’t possible. Today, Marlborough is known for the varietal, making Brancott Estate not only a pioneer, but a visionary. The brand, which originated in 1973, wanted to share the taste distinction that growing Sauvignon Blanc and Pinot Noir grapes in Marlborough provides. But the brand didn’t want to settle for a standard tasting and sales program. 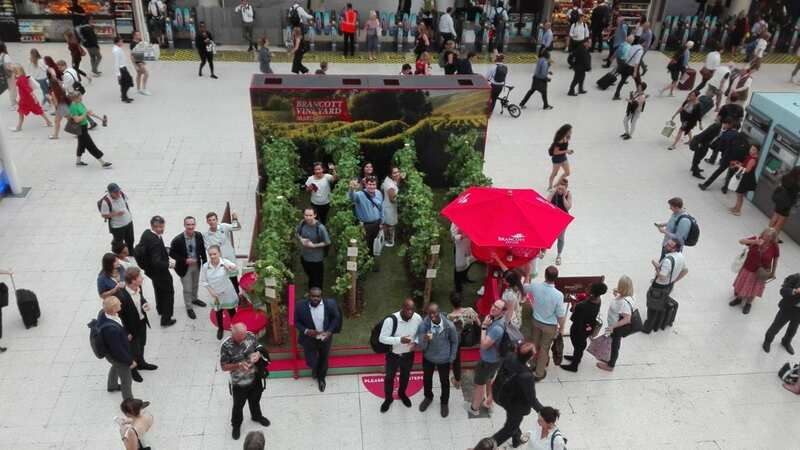 Instead, they brought a pop-up vineyard into London’s Underground Stations. Made up of 75 feet of living vines, commuters were provided an opportunity to take photos, enjoy a glass, talk to experts, and if they fancied, buy a bottle. To help facilitate this event, Elevate Staffing was enlisted to provide 5 staff, including 1 event manager, to 4 different Underground stations over 4 days to pour samples and speak with commuters about tasting notes, food pairings, and all things wine. Accept all cookies to watch the video.